The only problem with categorizing characters is that they’re supposed to be like people, and if you’ve ever met one, you may have discovered people are hard to put in a box. Trust me, I once tried to put my sister in a box, but she did not like that. I even hid in a box, but within the first ten seconds, I was getting awfully sweaty. Okay, so you can put an actual person in a box, but they don’t belong there. Moral of the story: you can’t always categorize characters. 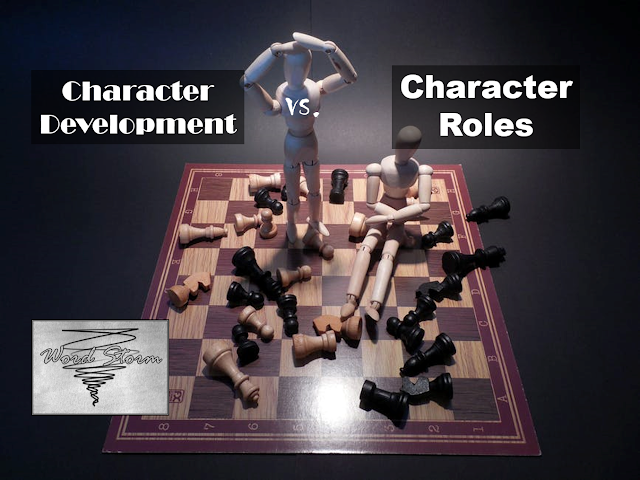 Today, I’m here to write about the difference between developing a character and assigning them a role. I did something different when I plotted out my last novel. Instead of going with notecards to plot out my story—which is incredibly time consuming to say the least—I wrote out the plot in a notebook. I discovered the plot and the characters as I went along and because I was writing everything down instead of typing it up, I discovered my characters as they appeared in the story rather than throwing them in there. This gave each character a little more freedom to be themselves. One character turned out to be a bookworm who lugged around a backpack full of books, and another turned out to be obsessed with coffee and music. Come to think of it, I don’t think I labeled any of my characters “villain”, and I definitely didn’t include “love interest” in my plotting like I usually do. That isn’t to say these types of characters didn’t appear in the story, but that I allowed them to establish their personalities before they revealed their roles. It was as much of a discovery process for me as it should be for readers. Character Development: What is it, and why do writers need it? Character development is the way writers make their characters seem more human. Writers give their characters dreams and aspirations, heartbreak and vices just like in real life. Typically, the best developed characters are the protagonists and their allies, but you’ll occasionally come across a well-developed villain. Writers need character development because it helps readers connect to the story. If a character is poorly developed or “flat”, readers won’t care about them. Have you ever connected with a piece of paper? How about a paper airplane, each crease pressed by the fingers of a five-year-old who dreamed of flying? Which example did you connect with? You can make people care about your story if you take the time to choose the right words. There are many ways to get to know your characters, and they’re not unlike getting to know people. You have their appearance and general small talk questions—their name, hometown, age, etc. Then you have my personal favorites, the deeper questions—their philosophies, passions, and motivations. Some people like to jot down the basics, and others like to interview their characters, asking them questions they can answer for themselves. Personally, I like to throw my characters into a situation and see how they react. Maybe they’ll freak out, maybe they’ll strike up a conversation, or maybe they’ll turn into a dragon and blast somebody with fire. It’s a tossup. Character Roles: Again, what is it, and why use it? Most stories have a protagonist and an antagonist, at least when it comes to adventure stories. Identifying these characters typically isn’t too hard. But a well-developed character should transcend character roles and their stereotypes. Not all protagonists (the main character) are heroic, and not all antagonists are villainous. The difficulty with categorization comes if one considers the adage “each character is the hero of their own story.” In other words, when writing characters, writers shouldn’t just treat one character like the love interest and another like the villain. If characters are to seem more human, they should be treated like people, not chess pieces. Funny story, in my latest novel, I actually stole my main character’s shoes wrote a couple chapters where she had to go barefoot. Writers, even if your character has to go without shoes, put yourself in their place and try to understand their perspective. I’m not saying your protagonist has to think and act exactly like you, but it’s always interesting to get into the heads of your characters. Once you establish who your character is and what they think about, it’s a lot easier to write about them. I’m the daughter of divorcees, a part-time mechanic, and a high school graduate who has no idea what to do with her life. Who am I? I don’t even know. But I’m not about to say that. When I took journalism in college, they taught us when conducting an interview to focus on “The Five W’s and an H”, also known as who, what, when, where, why, and how. When it comes to developing your characters, whether or not you choose to conduct a character interview, make sure you establish who your character is before that what role the character plays. Just as the who comes before the what in the Five W’s and an H, so the development should come before assigned roles. Give your characters a chance to be human before you try to shove them into a box. Focus on writing about people. Supersede stereotypes. And your characters just might surprise you and your readers. Let’s chat! Which do you work on first, character development or character roles? How do you develop your characters? Do you interview them or just jot down the basics? Which is your favorite character type to write about? Want to get it on more offers and updates for writers? Be sure to sign up for the Word Storm Newsletter! Next newsletter coming Dec. 15. Sign me up for more bookish news! Literary references: William Goldman’s The Princess Bride, Cornelia Funke’s Inkheart, and Sharon Creech’s Walk Two Moons.